A walk in McDonald Woods in late winter or early spring might be uninspiring to many people because of the drab gray trunks of dormant trees and seeming lack of activity. You might see the occasional black-and-white flash of a downy woodpecker flitting from tree to tree, or spot a white-breasted nuthatch as it navigates upside down, probing for whatever bits of protein it might have missed on earlier explorations. But who would expect butterflies? After all, 80-degree days and abundant flowers overflowing with nectar haven’t even awaken in our minds. But they are here, at least those few species that spend the winter, hidden away as adult butterflies under loose bark, inside piles of brush, or maybe in an old woodpecker nest or hollow log. Even though I know they are here, it is still a surprise the first warm day in March when I spot a mourning cloak basking in the strengthening sunlight. As I approach for a better look, it is likely to spiral upward, erratically flitting off to another patch of sun. The mourning cloak, eastern comma, and question mark are three of the common woodland butterflies at the Garden that generate a brew of chemical antifreeze earlier in fall that allows them to survive the coldest weather winter has to offer. Instead of migrating like the monarch or spending the winter wrapped in a chrysalis, these three are adults, wings at the ready to take advantage of the first warm weather of spring. The lack of nectar-producing flowers this time of the year does not deter them as they are perfectly happy to feed on sap from any of the branches that may have been damaged during winter storms, or drink the fermented liquid oozing from an injured willow or oak tree. Although butterflies are a generally short-lived organism, usually living only a few weeks, these three can survive for eight to ten months. 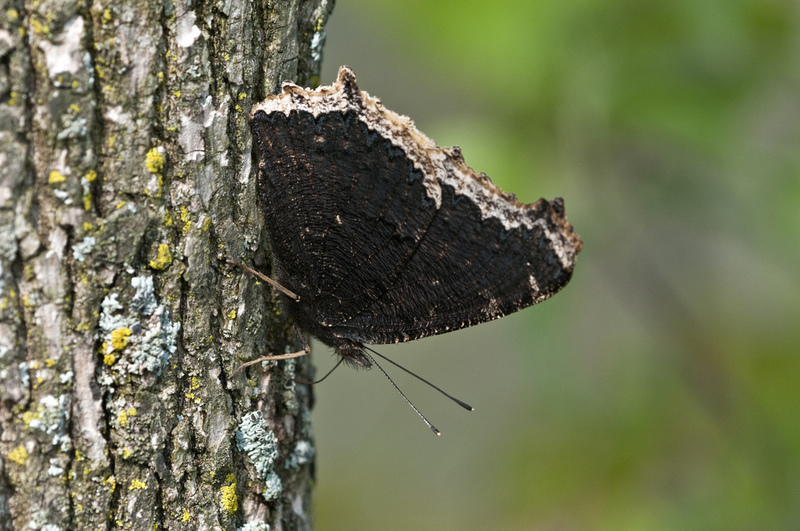 The dark, purple-brown color of the mourning cloak gives it an advantage at this time of the year. Those richly colored wings, held out to the sides, act like solar collectors absorbing the sun’s energy and passing it on to the body where it raises the temperature of their muscles enough to allow them to fly. The comma and question mark utilize a similar basking strategy. They often posses sun-absorbing, dark-colored under wings, which, when held closed against their bodies and perpendicular to the sun’s rays, elevate their temperature. 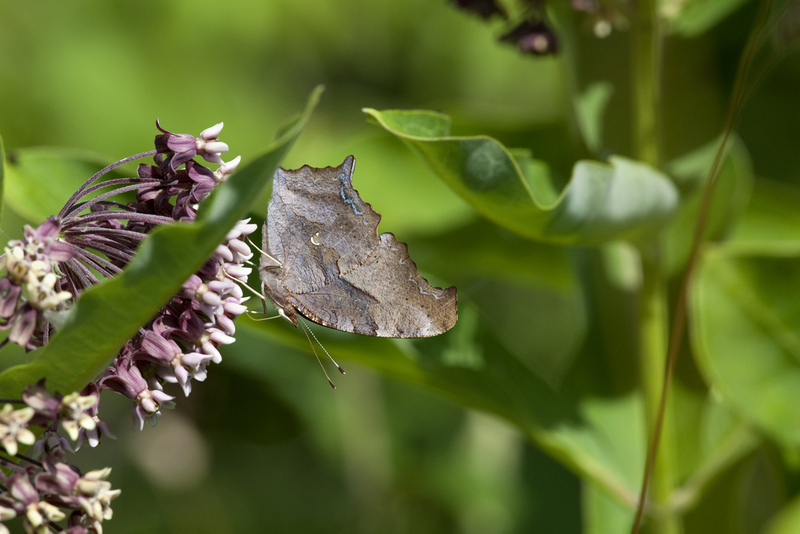 The thermal boost gives this group of insects a head start on the season by allowing them to exploit a habitat at a time of the year when there are few other butterflies around to compete for precious resources. Although these three butterflies are insects, and as you know all insects have six legs, these three belong to a group known as the brush-footed butterflies. They have modified fore legs that are smaller than their other legs and cannot be used for walking. If you get a chance to get a close look at one of them, you might be surprised to see that they are only standing on four legs. The other two are tucked under their heads. Next time you think of taking a walk in the dormant woods, pick a sunny day when these not-so-fragile gems might be out and about, soaking up sun and supping on sap.